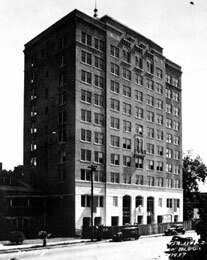 The Seagle Building had its origins in the 1920s economic and land boom. 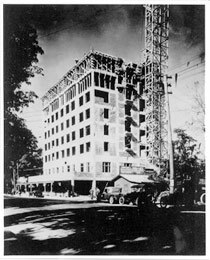 Conceived originally as the Hotel Kelly, the project went bust before the last floor was poured. It sat unfinished for over a decade  an eyesore to many in Gainesville. 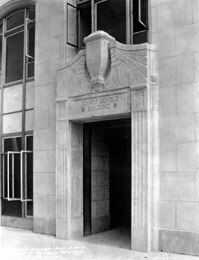 Finally, in the mid 30s a Jacksonville entrepreneur, Georgia Seagle, along with the University of Florida, the city of Gainesville, and Federal money finished the building naming it after Georgias brother, John F. Seagle. The building served mostly the University in the years following its completion. Having difficulty meeting modern fire codes as time past, the building lost most of its upper floor tenants. By the late 60s the Florida State Museum was the buildings only occupant. Upon the museums move to the nearby campus of the University of Florida, the building fell to complete abandonment and was eventually sold to a developing company from Kentucky for $1 with the understanding that the building was to be completely renovated. In 1983, the newly remodeled Seagle Building was once again a viable piece of real estate. Changes included modern wiring, plumbing, telephone and cable jacks, a fire sprinkler system, emergency diesel generator, an added internal concrete stairway providing two fire escapes for every floor, and many other improvements. The first 6 floors have been designated commercial space  the area which concerns this website  roughly 40,000 sq. ft. The remaining 5 floors are residential units; with 4 units per floor with the exception of the top floor which is one unit. Copyright © 2001 The Seagle Building. All rights reserved.